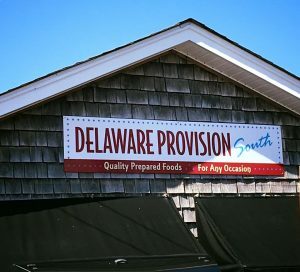 Delaware Provision South, LLC - DELAWARE PROVISION COMPANY, INC.
Delaware Provisions South opened its doors in January 2017, following the success of the Delaware Provisions Food Trucks success. Located in Millville, DE, this downstate location provides the same quality freshly made products that are known and cherished at the original location. Keeping with tradition, all of these products are made in-house. Just like the original location, customers can bring their wild game for processing. They can also purchase carry-out lunches and prepared foods. In addition, the latest addition to the Delaware Provisions family also offers amazing new dishes. This location also offers a full-service catering menu. New dishes to both the original location and this new setting include a variety of special infused sausages, such as pork broccoli rabe with extra sharp provolone, chicken cordon bleu sausage, chicken pineapple bacon and many more!